My Scale and Me | Beat the Diet Demons! 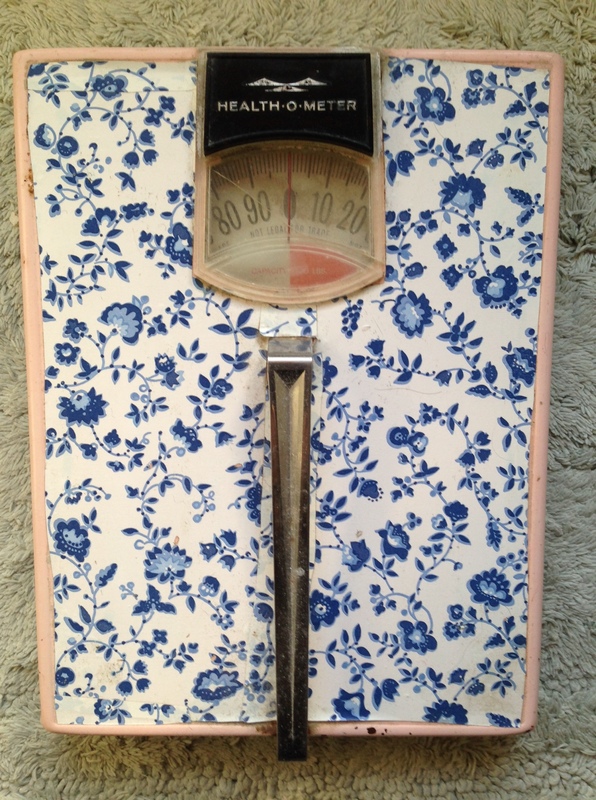 My scale and I are about the same vintage. The scale is the color of a 1950s pink bathroom. Its small, clouded plastic window is cracked, it perpetually registers 4 pounds light, and at some point I tried to mask its pinkness with blue-and-white contact paper. I’ve considered buying a sleek, new digital scale that will weigh me to the very ounce. But my memory of every major life event is accompanied by a 3-digit number, indelibly etched in my mind, from this particular scale. More accurate readings, reported at the doctor’s office or a Weight Watchers meeting, are a mythical blip on my radar–those numbers have no bearing on my reality: I measure my existence by the specific number shown on my old, pink scale. Do you remember your life by the number on your scale? Is that good or bad? My old scale has been both enemy and friend for a lifetime. When it gives me good news, I smile, maybe even gloat. When it gives me bad news, I get angry and want to throw in the towel on good eating. Often I avoid getting on it, because I know a “bad” number will affect me for the rest of the day, especially when I was expecting a “good” number. Always tall for my age, I don’t remember weighing less than 100 pounds. Kids are curious; asking another kid how much she weighs was part of the usual playground banter. When my weight exceeded 100 pounds, I didn’t like the surprised responses I received. I wasn’t fat, but I was a head taller than my much-less-than-1oo-pound school chums. I quickly learned to be embarrassed by my weight. Why is it that the number itself matters so much? While home from college one summer, I made a bet with my father based on my scale. If I got that scale to say 135, he’d send me back to college with my own car. I got it in writing and wrote up a contract which Dad dutifully, and hopefully, signed. I dreamed of a vanity license plate showing my 3 initials and the number 135. For a few weeks, I diligently dieted. But I quickly became bored and went back to my old habits. By the end of summer, little progress had been made. I still dream about that license plate! And I still don’t weigh 135! Shall I keep trying or is that number mythical, too? Is it possible our bodies are meant to be a certain weight, even if we don’t agree with the number? To add your comment, click on “Comment.” The default comment log-in for visitors is their WordPress.com account. If you prefer to use your social media log-in, click anywhere in the comment form, then click on “Change” and choose the Facebook or Twitter icon. This entry was posted in Uncategorized by Adele Bennington. Bookmark the permalink. I don’t enter into a personal relationship with my scale (but there it sits in all its digital smugness and I hate it.) I want to ask, “What are we really measuring and for whom?” but that’s a whole ‘nuther conversation. I’m convinced there’s no winning this one. When I was younger I was teased about being thin (thin was not something I could help, and being teased and criticized was awful.) Now I’m not particularly thin and the number I weighed until my 40s plagues me if I let it. Is it physiology or mis-management? Beats me. But I’m staying away from that scale. I am with Karen. I have the new digital scale and like it, though I don’t use it often. I like going by how my clothes fit, how I feel and whether I am living a a healthy lifestyle (exercise, lots of water, sleep, lower carb & sugar diet, etc.). That makes me feel better than a scale number.